Der Artikel Georges Onslow (1784-1852): Klaviertrios Vol.3 & 4 wurde in den Warenkorb gelegt. Onslow Klaviertrios – Jetzt komplett! Onslow's Piano Trios – Now Complete! 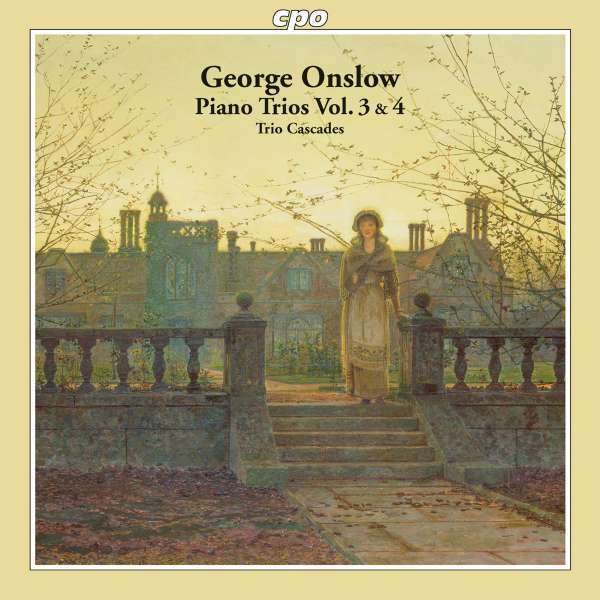 The last two volumes of George Onslow's complete trios demonstrate once again that the rediscovery of this virtuosic, dramatically expressive, emotionally intimate, and finely crafted music is long overdue. 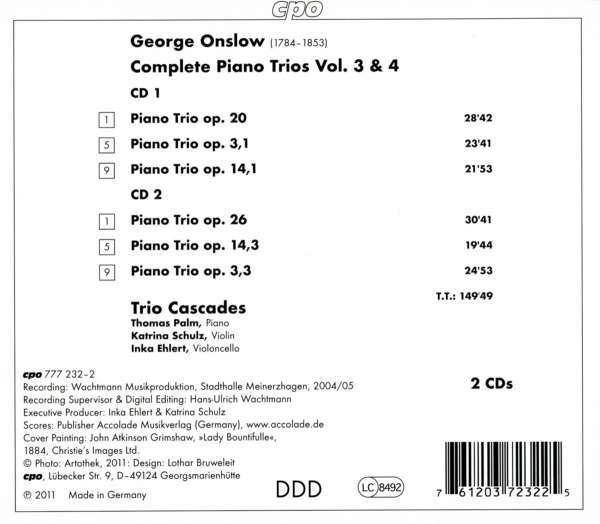 The trios display a wealth of ideas together with original melodies and what is sometimes a surprising chromaticism. And right from the beginning of the Allegro energico with which he sets in motion his Opus 20 and seventh trio it is clear that Onslow already in 1822 had entered a compositional phase in which the piano is treated as a virtuosic instrument of full concertizing potential. In this work often termed a »salon piece« the composer lends free rein to his brilliant style, which is above all in evidence in the fast movements. »The three musicians of the Trio Cascades outstandingly know how to present Onslow's music both with weightless elegance and with deeply felt emotionality« (klassik. com 10 / 07 of Vol. 2). Diese Onslow-Trios sind eine wirkliche Entdeckung. Nachdem ich die ersten beiden Disks mit dem tollen Trio Cascades gehört hatte, freute ich mich schon sehr auf diese Doppel-CD und wurde in keiner Weise enttäuscht. Das ist auch tolle Musik und von allen drei Musikant(innen) hinreißend schön musiziert.